Sadao Watanabe was born in Gunma prefecture in 1933. Known by the nickname “Nabesada,” he is a well-known Japanese jazz musician. 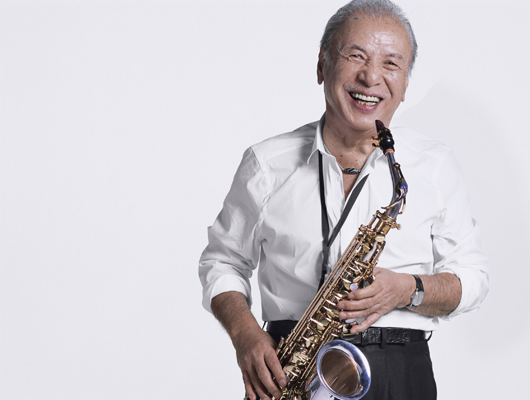 Watanabe has done sessions with many bands as an alto saxophone player, and in 1962, he studied abroad at the Berklee College of Music in Boston. He is a top Japanese musician, and with his unique style that is not confined to jazz, he plays an active role on both the Japanese and the world stage. Furthermore, he is acknowledged for his talent as a photographer, broadening the breadth of his activities. In recent years, he has been putting effort into musical exchange with children all over the world, promoting the message of world peace through music.